The study screen is where all the action is -- it's where you practice words, whether they are new or pending review. 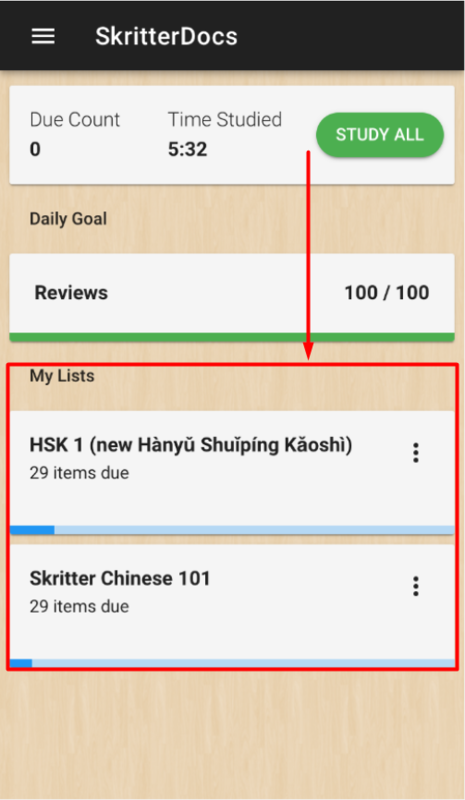 In addition to practicing / reviewing, you can add new words manually, change study settings, and view more detailed information directly from the study screen. Tapping the Study button brings you to the study page, where you write characters and answer reading, definition, and tone prompts. 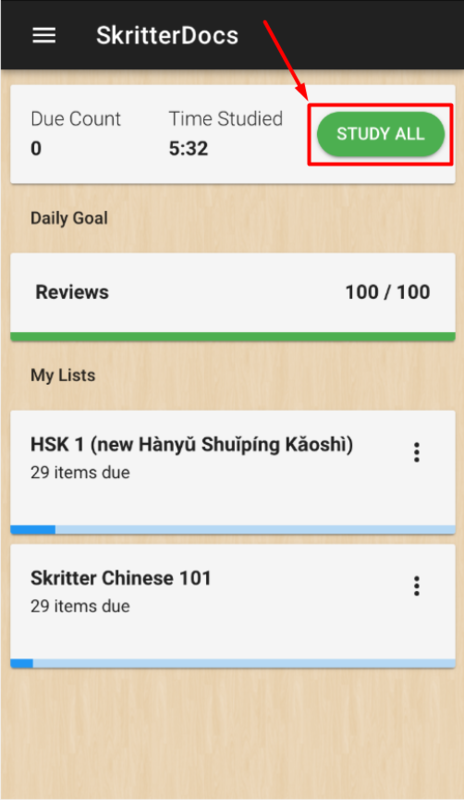 Skritter automatically takes turns adding new words from all lists you are studying, along with bringing them up for review when they're due. 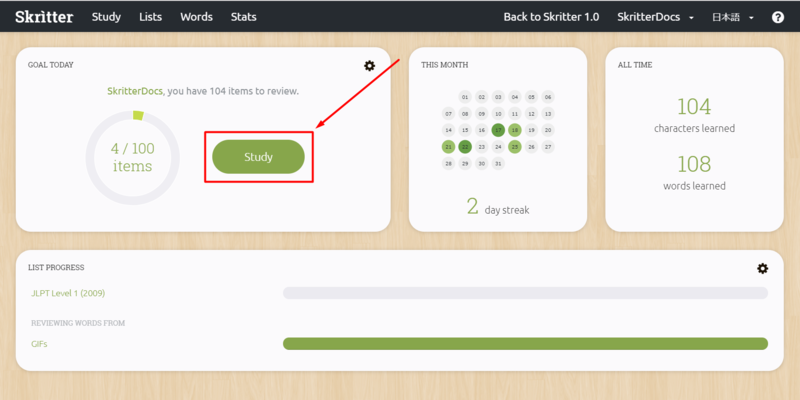 The study streak area shows how many days in a row you've kept it up. The darker the circle, the more items or time spent studying that day. You can mouse over a date to see how many items were studied and how much time was spent. The all time stats area shows how many total characters and words you've learned throughout all of your lists. 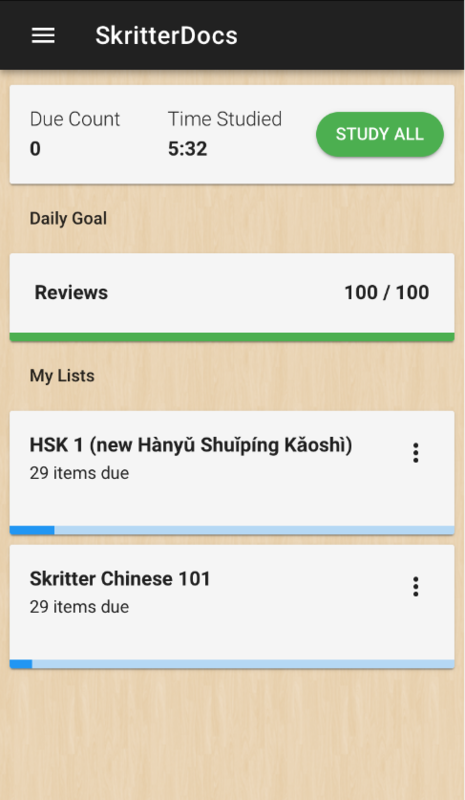 The lists area shows all of your active lists that are adding new words, along with it's completeness progress, indicated with the blue bar. 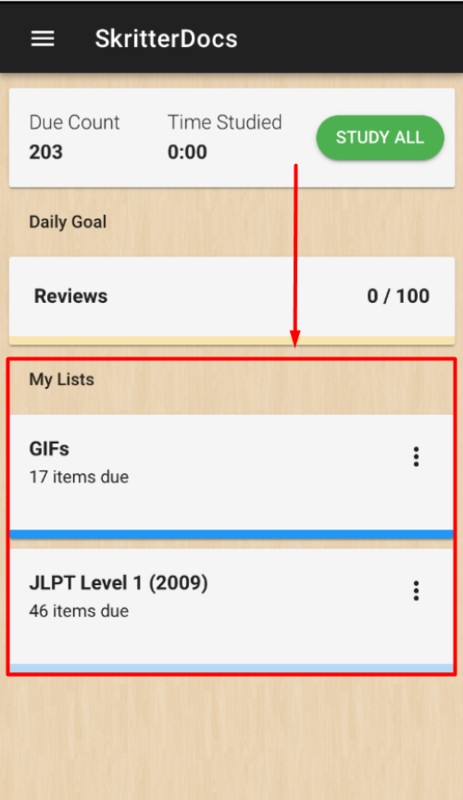 You can study a single list section by clicking Sections next to the list's name, and then selecting a specific list section. 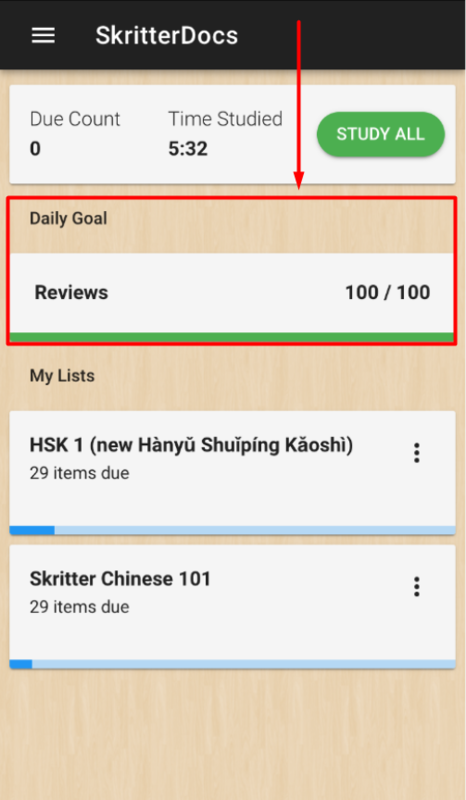 You can study the single list itself by clicking Study next to the list's name. Looking for an answer to a question or experiencing difficulties? Simply click the (?) icon in the lower right hand corner from anywhere on the site, and briefly type what you're looking for. Relevant guides will pop up if available! 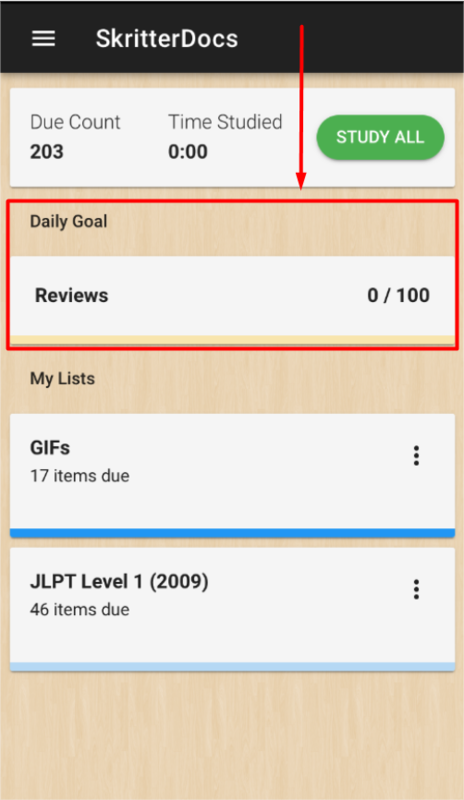 The daily goal shows your daily progress on the number of reviews or time spent depending on how you configure your daily goal setting. 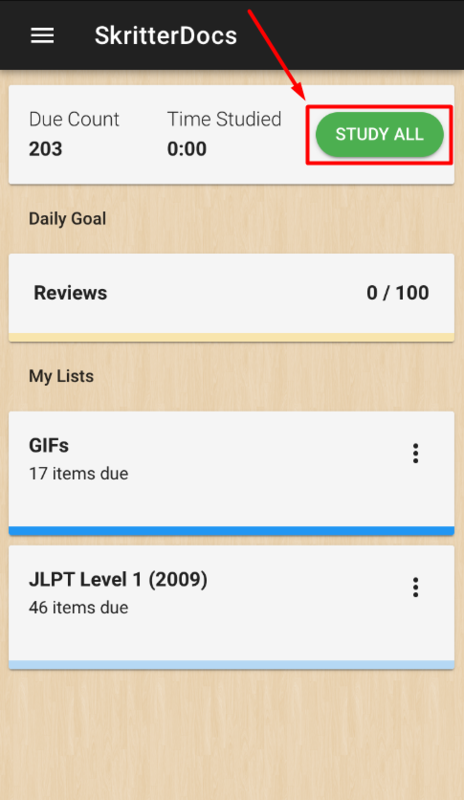 The lists area shows your active lists that are adding new words, along with . Tapping the Study button brings you to the study page, where you write characters and answer reading and definition prompts. 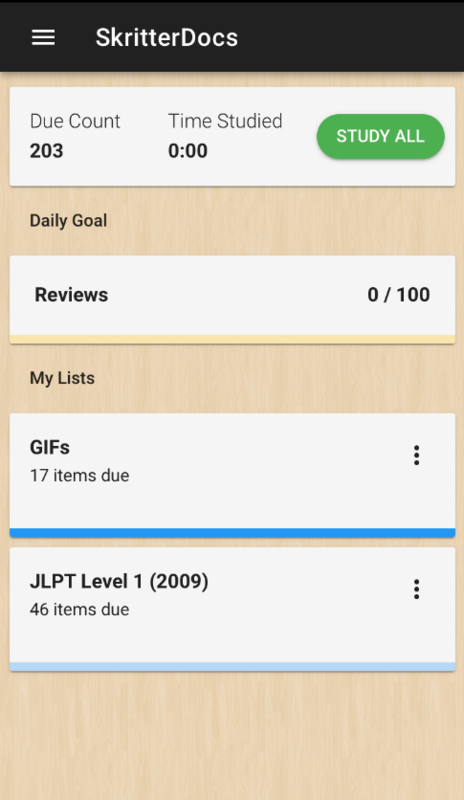 The lists area shows your active lists that are adding new words.